We love our gadgets here at PhoneArena but even so, it's always a treat to see the numerous ways in which they can be destroyed. Though dropping, bending, scratching and burning are all pretty fun, there's surely nothing more gratifying than seeing a pristine slab of craftsmanship and innovation reduced to a useless, indeterminate pile of rubble. Having seen the beautiful Galaxy S7 edge burn and bleed to a painful death by means of hydraulic press, a unit of Apple's new iPhone 7 has just been treated to a similar demise. Where the aforementioned S7 edge destruction saw the device laid flat, this particular instance deals with the device from a standing stance. 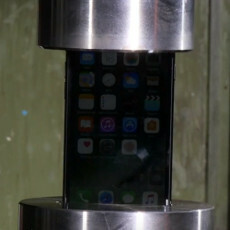 Of course, the hydraulic press makes pretty light work of the new iPhone and its metallic housing, which has been toughened by Apple post-Bendgate. Maybe it's just us, but we definitely take a perverse pleasure in watching the mobile industry's darlings folded into nothingness. The iPhone 7 may be an expensive and highly sought after handset, but in a world ruled by the hydraulic press, it's a mere peasant. Provided by the folks at the Hydraulic Press Channel on YouTube, we're sure this is the most satisfying thing you'll see online all weekend. Then again, this largely depends on the kinds of sites you like to frequent. I love this man's channel. He crushes almost everything, and his jokes with that broken english cracks me up. Put the Nokia 3310 under it and see what happens. Yeah, someone buying ALL the iPhones would really piss Apple off I'm sure... Great logic. That was the best sight of recent times! Don't waste your time bro. He's as hardheaded as he is faithful. His response won't be anything beneficial...... of that I can guarantee. It's just that his stalking is getting out of hand. I swear, like I feel everytime I might talk about this issue, he would pop up out of nowhere with all of his attacks and accusations. Bro, we know how real and honest you are. Don't feed the trolls. That proof is undeniable lol. He's thinking of a rebuttal. Troll got rekt indeed, that should shut him up. I really do hope your Note 7 get replaced, really bad for Samsung if it isn't. Yep, Samsung should exchange it no questions asked. I am surprised to see the battery not going up in flames like it did with the S7E. Of course it could be because of the vertical position, the stress on the battery is different. Am I the only one enjoy to see this cr@p get thrashed? Yes......and I think you should seek psychiatric attention immediately. People don't usually enjoy seeing things mangled, especially expensive things. People that easily blinded by a stupid logo that should seek psychiatric attention, like you. I don't care about solos either, but I love Han. He made the Kessle run in 12 parsecs. Like people that still religiously defend that "SAMSUNG" logo despite all the explosions... The difference is you really mean what you say while I know Samsung is still a good brand. You actually hate a company and users of its products for no good reason. As long as it is not mine ;) And watching idiots wreck their supercars on youtube is actually quite funny. Nope, this is the right treatment for a crappy product. See what I mean Hugo? Do you really want to be associated with guys like ^this. One of my favorite YouTube channels. Pure crushing bliss and the guy is hilarious. Don't forget to always wait for the "bonus content" at the end of each video. First of all, I'm not an Apple fan, but I can't understand this stupidity to destroy a phone like that. What user will put their phone, Apple or Android under such a stress? What is even worst is the comment of the editorial guy this wannabe Ben R, that he actually enjoy it such an stupid and useless test! Read his comment: "Maybe it's just us, but we definitely take a perverse pleasure in watching the mobile industry's darlings folded into nothingness. The iPhone 7 may be an expensive and highly sought after handset, but in a world ruled by the hydraulic press, it's a mere peasant" A total nonsense!